From left: Thuy Nguyen (SUN Movement Secretariat), Dr. Masekonyela Sebotsa (FNCO), Fanny Granchamp (SUN Movement Secretariat), Merlyn Chapfunga (WFP), Gerda Verburg (SUN Movement Coordinator), HM King Letsie III (King of Lesotho), Wilhelmena Westerlaken, Elias Tiisetso (FNCO) and Mpolai Moteetee (UNICEF). 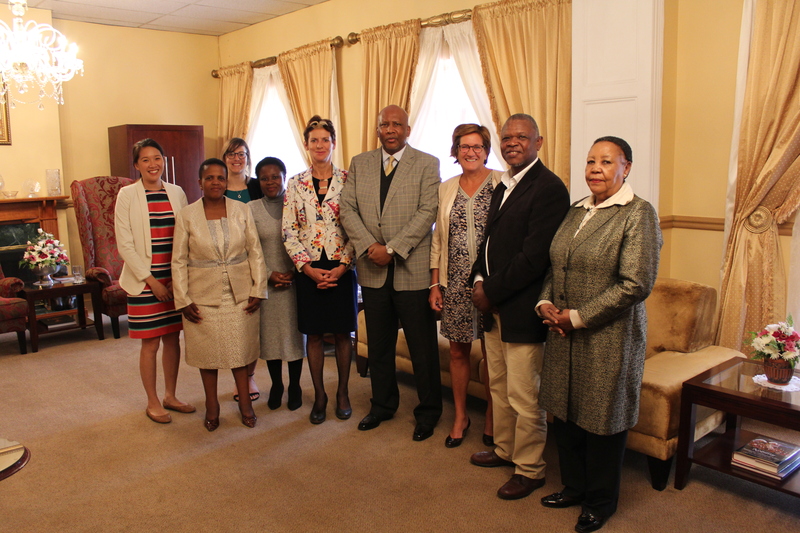 From 30 April to 2 May 2017, SUN Movement Coordinator Gerda Verburg visited high level leaders in Lesotho to reflect on progress made and priorities for nutrition in coming months. As Lesotho heads into elections, the meetings were at an opportune moment to ensure continued high level commitment with the incoming government. 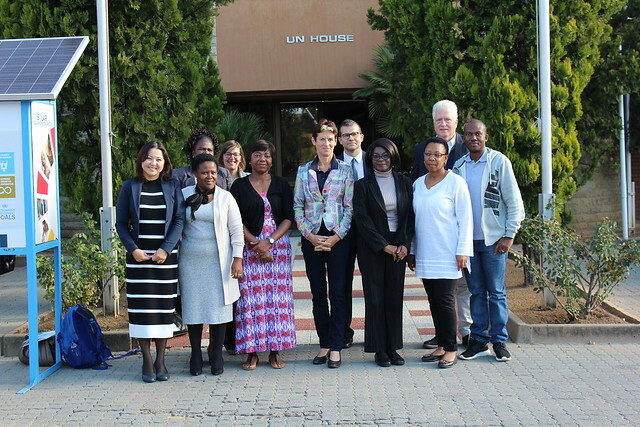 The visit follows the launch of three key milestones in 2016 – the launch of the new Food and Nutrition Policy, the Cost of Hunger in Lesotho study and the launch of Lesotho’s Scaling Up Nutrition Movement. In collaboration with the Food and Nutrition Coordinating Office (FNCO), meetings were held with the ministries of Health, Finance, Planning, Agriculture, Foreign Affairs, Education and the office of the Prime Minister. A meeting on the final day with His Majesty, King Letsie III proved fruitful, particularly as the King holds the title of nutrition champion for the African Union and was awarded Special Ambassador for nutrition by the Food and Agricultural Organisation. The King expressed his desire to continue working closely with the Movement through the FNCO to ensure that lessons from the Movement are used to inspire efforts in Lesotho and that Lesotho’s own success stories can be shared across the Movement. 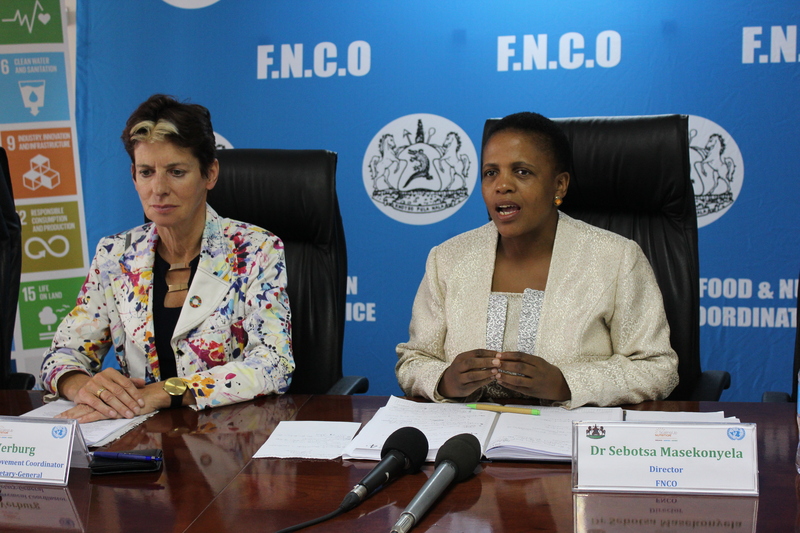 The visit culminated with an in depth Press Conference where Dr. Masekonyela Sebotsa, Director of the FNCO, made a plea to all actors to act with urgency to end malnutrition across the nation. 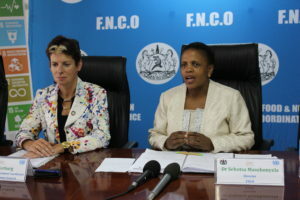 She stated that Lesotho is losing 1.9 billion Maloti (US$200 million) each year on increased health care costs, reduced learning capacity and reduced income generation due to the long term effects of malnutrition. Dr. Sebotsa refers to the findings of the Cost of Hunger study, a tool which she intends to use with the FNCO to advocate for more attention and resources to nutrition throughout 2017.